Document Notes: This personal letter from the C.G. 36th Inf. 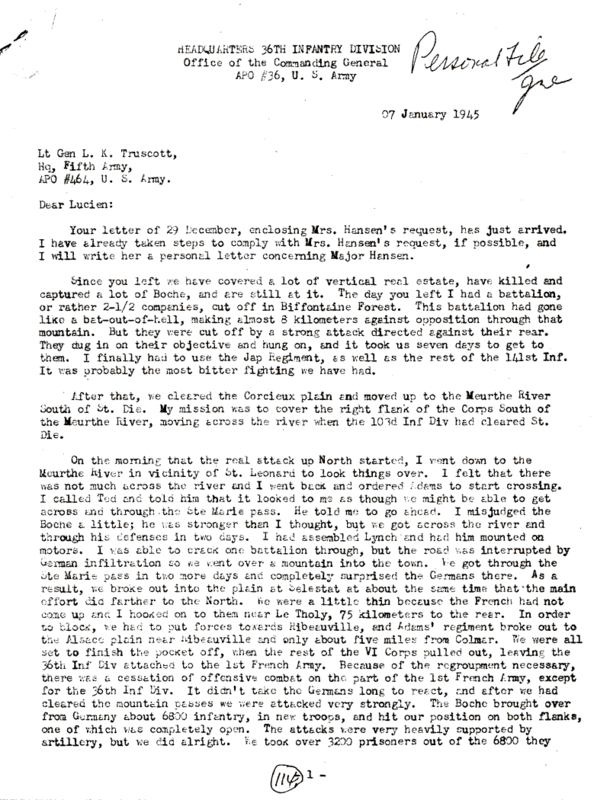 Div., to which the 442nd RCT was attached, to the former Corps Commander, Lt. Gen Lucien Truscott, now the Fifth Army Commander, gives details regarding the fight for the "Lost Battalion." The 442 is identified as one participant in the action. The other is the never mentioned, nowadays, 141 Inf. Regt from which the 2 1/2 companies of the Lost Battalion came. That the 141st is never mentioned in contemporary accounts of the action and the exaggerated number of 442nd casualties incurred speaks to the revisionist efforts of the JACL and others.